One day, I needed some bacon for a recipe – but I didn’t have time to fry it myself. In a pinch, I scoured the grocery store’s salad bar and saw chopped bacon bits. I put about 1/3 cup into a small container, and was surprised when the bacon rang up for 34 cents. Thirty-four cents! That’s a lot cheaper than buying a package of bacon. And it’s much easier, too. The bacon was already cooked and ready to use. No hassle, no mess! Before you head to your local supermarket to stock up, there are a few things you should know to help you make the most of the salad bar. Before your first trip around the salad bar, it’s important to know which items are cheaper and which are more expensive than when you buy them off the shelf. However, these percentages won’t always hold true. Salad bars at grocery stores can vary widely in price. I’ve seen salad bar prices as low as $5.99 per pound and as high as $8.99 per pound. If your local grocery store is on the lower end, consider yourself lucky and feel free to indulge. Or do your own comparison between the price at the salad bar and the price on the shelf! If I need an ingredient for a particular recipe and know I won’t use an entire package, I will purchase a small amount from the salad bar instead. Again, prices vary. You’ll want to carefully consider how much a particular item would cost if purchased individually to determine if it’s a better deal on the salad bar. If you’re trying to figure out if the item you’re buying is a good deal, consider its weight. Cooked pasta, for example, is heavy, so it’ll cost you more at the salad bar, where you’re charged by weight. It’s usually cheaper to buy dried pasta and make it at home. Hard-boiled eggs are another heavy item that can cost much, much more at the salad bar than it would to make yourself. You’ll want to avoid buying salad dressings off of the salad bar. A 16-ounce container of ranch dressing at the grocery store costs $4.99, and purchasing 16 ounces of ranch dressing from the salad bar could cost nearly twice as much. You’ll be surprised at the items you can find on the salad bar: sun-dried tomatoes, feta cheese, roasted garlic, shrimp, pomegranate arils – the list goes on and on. If you need a small amount of an “unusual” ingredient, check the salad bar before purchasing an entire container. I often purchase roasted garlic from the salad bar to add to pizza, scrambled eggs or hummus. Roasting garlic in the oven takes a long time and thus a lot of energy, so purchasing it from the salad bar is a no-brainer for me. What’s considered a good deal when it comes to price per pound? $5.99 per pound is very affordable, and $8.99 per pound is on the higher end. My local Whole Foods is $8.99 per pound, so I try to avoid purchasing too much there unless it’s a hard-to-find item. The salad bar at another local grocery store is $6.99 per pound, and is my go-to for a variety of grocery items. On your next trip to the grocery store, take a swing by the salad bar. Once you start using it to supplement your grocery shopping, you’ll never go back! 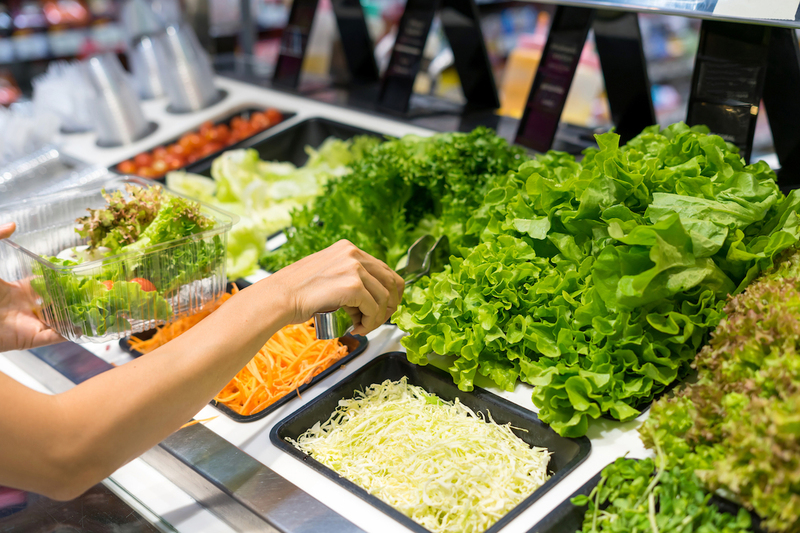 Your Turn: Are you a grocery store salad bar shopper? Please share your tips and tricks in the comments section below. Haley Nelson writes Cheap Recipe Blog, which features budget-friendly recipes and money-saving tips. She’s been using the grocery store salad bar since 2010 — long before it was cool.